Broadcast revenue rose 31.3% to £37.3m and sponsorship revenue rose by £1.6m, but matchday income was down 1.6%. 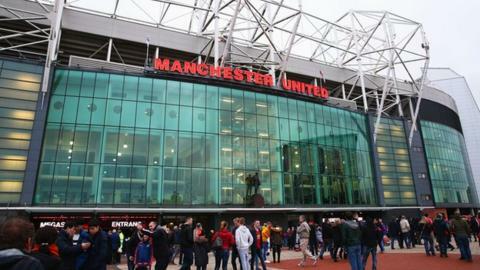 £1bn from sponsors, 116m social media followers and a new £5bn TV deal - why Man Utd are set to become the world's richest club. "Our solid results off the pitch help contribute to what remains our number one priority - success on the pitch," said executive vice-chairman Ed Woodward. United's chances of qualification for next season's Champions League hang in the balance after an inconsistent season under Louis van Gaal. Majority-owned by the American Glazer family, they are six points adrift of fourth-placed Manchester City. Leicester have a five-point lead at the top of the table - and defeated City last weekend with a team that cost £22.5m. "Leicester is a fantastic reference point for everybody this year," said Woodward in a conference call with investors on Thursday. "Some players are bought by other clubs with an eye to them developing into something special in a few years' time whereas there's perhaps more pressure on bigger clubs to bring in players who are going to hit the ground running, top players verging on world class almost immediately. There is a slightly different market in which people are buying." The BBC understands Van Gaal's position is precarious after learning that Jose Mourinho has held talks with the club about taking over in the summer.